We’ve been working on a really neat project with Ginger Elizabeth Chocolates for a while now; a snazzy custom mold for her chocolate bars. It has been really fun to fire up some CAD software and draft a real, physical object – and after a whole mess of revisions and a rather large stack of 3d printed sample concepts, we ended up with a final design that everyone was happy with. Cool. Except, here’s where things started to go wonky. Sometimes it’s hard to make things exist. You think things will just work, you think you’ve got all the potential issues accounted for, and then you realize there’s some damn thing you were not smart enough to consider. When I saw the first test bar, I went totally emo. When the prototype mold came back from Belgium and Ginger was able to make her first test bar, we found that the contraction/expansion of the chocolate while cooling in the mold was leaving little goobers on the top of the bar. The design’s large, flat surface area really made it noticeable. When she showed it to me I went totally emo. There was no way the bars would be usable in that state. The manufacturing costs involved with fabricating custom molds like this are super high, so we had to try and figure out a way to make this thing work. 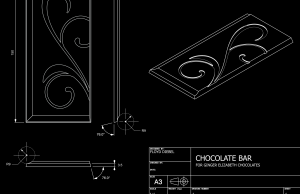 After trying some ideas that didn’t succeed, we came up with a solution to add a very fine texture of parallel lines to the face of the bar; now the chocolate will have room to “breathe” while it cools and there won’t be any visible marks left behind. Yay! Yesterday Ginger sent me a photo of her first test bar with the new mold and I breathed a sigh of relief. It worked! I’m pretty happy with it. I hope her customers will be too. They’re beautiful! What a cool project. Thanks! That design was an epic journey. It’ll be nice to finally eat one.